Campaign "Indigenous Blood: not a single drop anymore"
At the request of the Articulation of the Indigenous Peoples of Brazil (APIB), Docip would like to inform you on their campaign "Indigenous Blood: not a single drop anymore". Thirty years after the adoption of the 1988 Federal Constitution, which brought respect for the cultural identity of Indigenous Peoples and the right to the lands they traditionally occupy, we continue to suffer threats. The most recent, committed by the new government of Jair Bolsonaro, came with Provisional Measure (MP) No 870/2019 and the decrees signed by the president to reorganize the structure and ministerial competencies that deliberately left serious gaps in the instruments and socio-environmental policies. With MP 870, the President transfers the identification, delimitation, recognition and demarcation of Indigenous Lands (TIs) to the Ministry of Agriculture, Livestock and Supply (MAPA), emptying the National Foundation of the Indian (Funai). In the last years, the political and economic conjuncture has been imprinting a developmental rhythm to the country where the Amazon and the Cerrado play the important role of "motor of the economy". Large infrastructure projects and the agricultural frontier are spreading fast on the forest and savannah, trampling biodiversity, protected areas, ignoring rights and significantly affecting the quality of life of local communities. The land dispute linked to the historic lack of governance in these regions results in scabs that set as scars in the heart of the world's largest rainforest. This situation has allowed different aspects of environmental legislation to be relaxed or reinterpreted, reducing the protection of our ecosystems and undermining the constitutional rights of Indigenous Peoples and local communities. In fact, the Brazilian government signals the tendency to continue giving in to the wishes of the ruralists. Tereza Cristina, the new Minister of Agriculture, represents the interests of agribusiness in Mato Grosso do Sul, a state that is the scene of the most complicated demarcation processes due to land disputes. With this, it is very probable that the process of identification and demarcation of Indigenous Lands will be slowed down and the barriers that prevent deforestation will be loosened. It is also unclear who will be responsible for ensuring the integrity of the Indigenous Lands, which formerly belonged to Funai. The body, previously subordinate to the Ministry of Justice, is now controlled by the Ministry of Women, Family and Human Rights, led by the conservative minister and evangelical pastor Damares Alves. Disrespect for the constitutional rights of these peoples touches on issues such as deforestation, invasion of protected areas, slave labor, illegal logging, mining, loss of biodiversity, land conflicts, violence and murder in the countryside. It is good to remember that Brazil is the most dangerous country for land and environmental activists: in 2017 at least 207 indigenous leaders, community activists and environmentalists were murdered worldwide to protect their homes and territories from the effects of mining, agribusiness and other activities that threaten their way of life, according to British NGO Global Witness. Brazil was the most deadly country for those who fight these fights, with 57 murders. In addition, in recent years, the criminalization of indigenous leaderships has intensified due to their struggle for rights, especially in the Northeast and South of the country. Indigenous lands are assets of the Union, and Indigenous Peoples are given permanent ownership and exclusive use of the treasures of the soil, rivers and lakes in them. It is the State's duty to protect them. However, even after demarcated, these territories are not free of threats. TI Karipuna, in Rondônia, ratified in 1998, has over 10,000 hectares of forest destroyed as a result of illegal logging. The TI Indigenous Arara, also in Pará, has just been invaded by loggers. In other regions of the country, where people wait for the demarcation of their sacred territory, the situation is even more serious. In Bahia, for example, 490 indigenous Tuxá families were surprised in November by a court decision to immediately evacuate the Surubabel or Dzorobabé territory, traditionally occupied by the community. The demarcation of Indigenous Lands represents a guarantee of protection to the forest and the people who depend on it to live. Land is the basis of a people's habitat, and the sustainability of the natural wealth there assures the physical and cultural survival of Indigenous Peoples. The Articulation of the Indigenous Peoples of Brazil (APIB) launches this week the campaign "Indigenous Blood: not a single drop anymore", with the aim of mobilizing the society for the Indigenous Peoples' Rights. 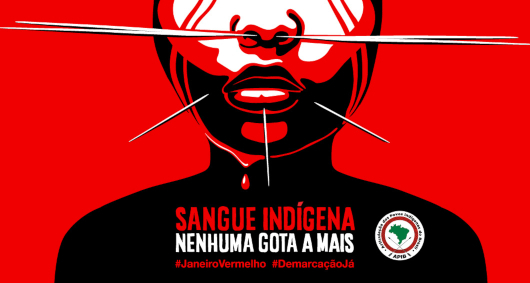 "The idea is to bring together various activities, organized by the indigenous movement and its supporters, in a mobilization agenda for #JaneiroVermelho," says Sonia Guajajara, coordinator of APIB. Organize your circles. Connect your networks. The indigenous struggle is permanent and needs your support: promote conversation circles, debates, write articles ... Be part of the campaign and add your activities to Red January. Inscrivez-vous à notre liste de diffusion pour recevoir nos messages par e-mail !